This granite landscape boggles my mind. No matter how many times we hike, climb, sit, fall, wonder and ponder in this environment, we never get tired of this view. 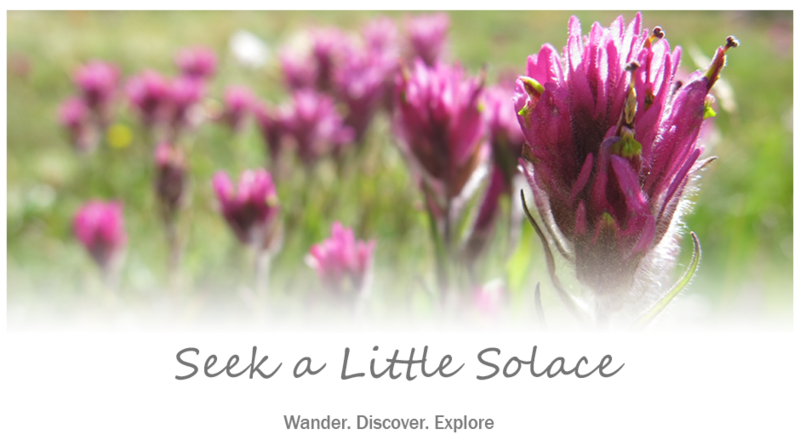 Out here, one can feel deeply connected to everything in the world around you and at the same time, unbelievably small and alone. It never ceases to amaze. 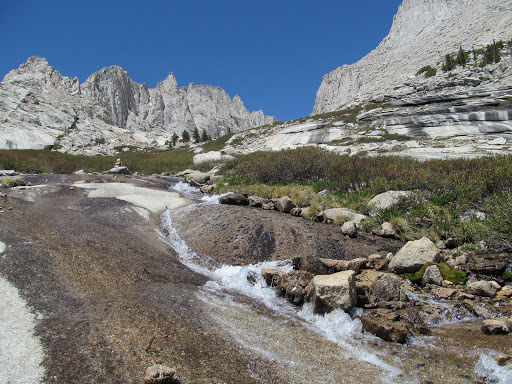 Yesterday, we headed to the Mount Whitney area for a hike up the North Fork of Lone Pine Creek. We always enjoy this trail. 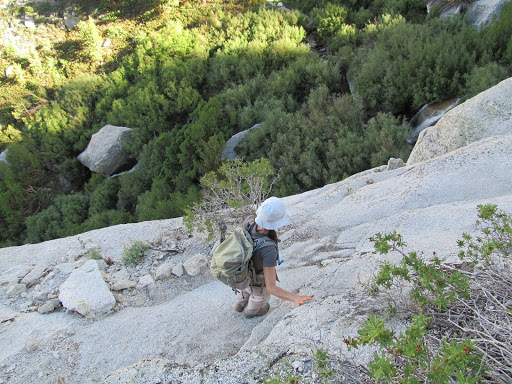 It is pleasant to hike with numerous stream crossings, shaded fern-covered forest floors, adventurous ledges to traverse, water streaming down granite slabs and of course, those imposing granite peaks. 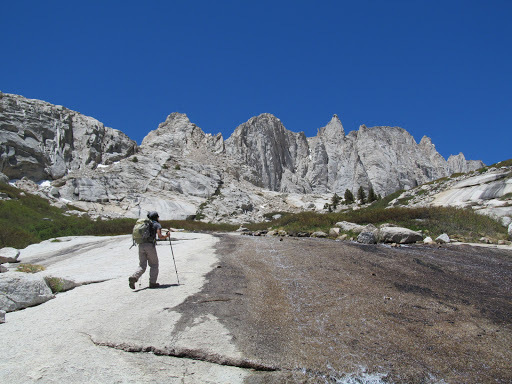 We were not really sure of our destination, maybe Thor Peak or just to Lower Boyscout Lake? We just enjoyed the morning light, the quiet peace, the rhythm of movement and waited to see where the trail would take us today. 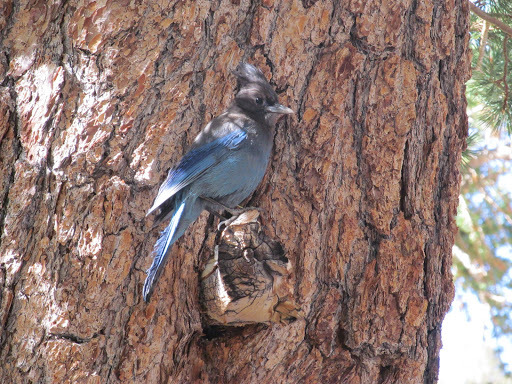 It was a beautiful day and after several weeks of being housebound with work projects, it felt great to be out hiking! 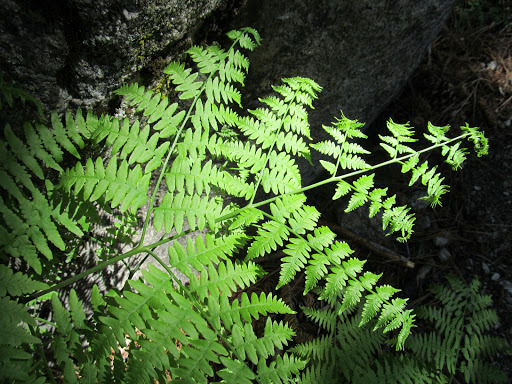 My hubby was in his groove and I had a hard time keeping up, but I was enthralled with the sights and sounds of early summer in the Sierra Nevada. We reached Lower Boyscout Lake in (what seemed to be) no time. We sat down to enjoy some tasty trail treats only to realize that Mister’s food bag was still safely nestled between the spinach and the leftovers in the refrigerator…at home. So, the question was, how far can we hike with just one girly-size bag of food to sustain the both of us in this high-altitude playground? 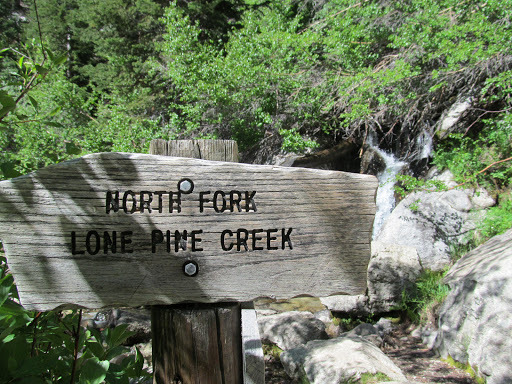 We nibbled, literally, on some trail mix and an apple and continued up the trail to Upper Boyscout Lake. 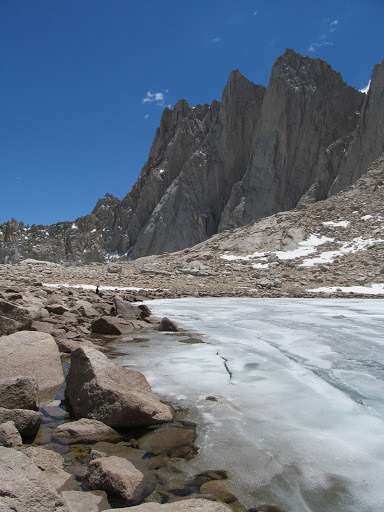 My favorite part of this trail is the big expanse of smooth granite where artful cairns mark the way and water streams alongside you as you hike up the slabs, with the pinnacles of Mount Whitney soon to enter the view. Postcard. Wish you were here! Nearing Upper Boyscout Lake we had to decide…do we try to discern the route up Thor Peak or hike on by to Iceberg Lake? Both stand above 12,000 feet. With a slight food shortage, I was not keen on the idea of fumbling my way through too much third class terrain in my slightly oxygen-deprived state. Mister was pulled in both directions. Dilemma. We decided to continue on to Iceberg Lake as neither one of us had been there before and the view of Mt. 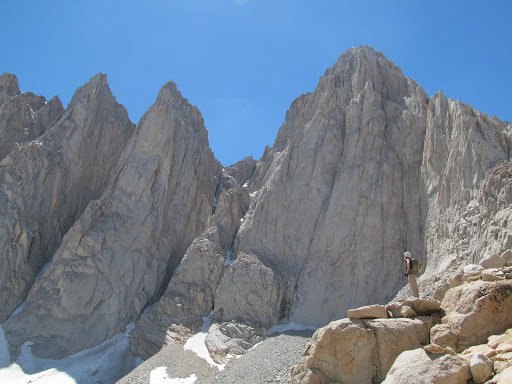 Whitney’s pinnacles would undoubtedly be impressive. And it was, indeed, impressive. At this point I was quite tipsy from the altitude and lack of nourishment, but I managed to make it up the steep slopes to the lake without tumbling off any boulders or starting a rock slide. Iceberg Lake (at about 12,600 feet), was very quiet and peaceful despite signs of a large group descending the mountaineer’s route, an increasingly popular route up Mt. Whitney. At the lake, we relaxed for a short time as we contemplated our oneness and our smallness. 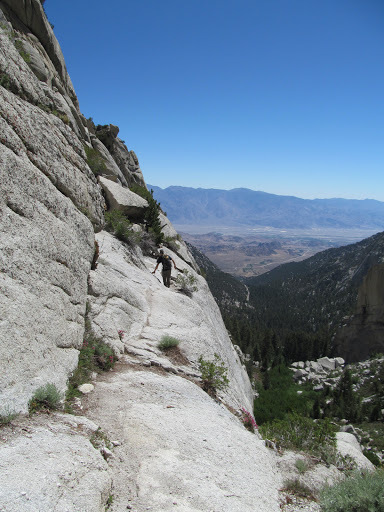 We rationed out our tiny shares of food, then started making our way back down the trail. We were almost out of food by the time we got back to Upper Boyscout Lake. We had resorted to stingily counting swigs of coconut water and splitting the last gluten-free cracker in half. But we were feeling satisfied and enjoyed contemplating which meat and dairy-laden entrees would be ordered from the Mexican menu once we were back in Lone Pine. 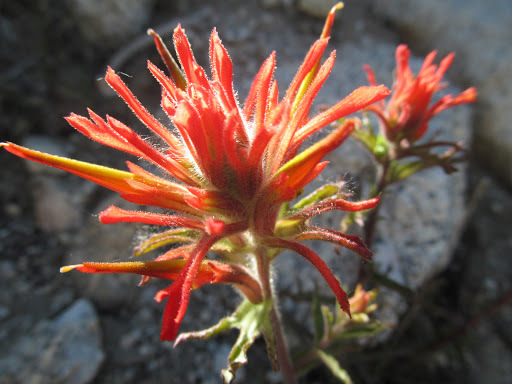 The trail down was alive with wildflowers and critters and photo ops were abundant. I was personally delighted to see so many flowers in bloom! 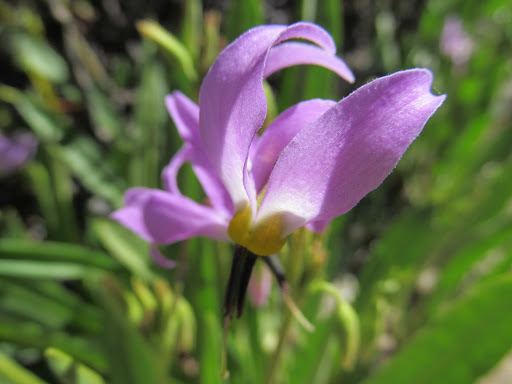 With the low snowfall this year, I didn’t expect a successful wildflower hunt this season and that is always one of my favorite aspects of our hikes. 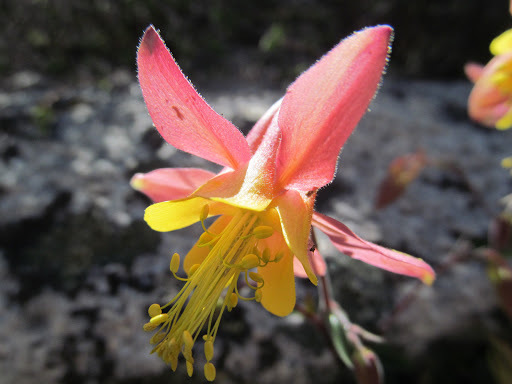 The afternoon light showcased quite a few beautiful blooms for me: crimson columbine, shooting stars and desert paintbrush are a few of my favorite Sierra classics. 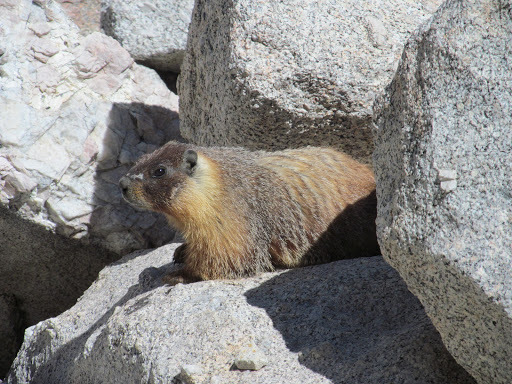 We even encountered a mellow marmot and a Stellar’s jay who were more than willing to pose for photos. It was a good day and I was filled with the satisfaction of being able to experience so many things I love in one day outing: the physical challenge of a good hike, the grand scenery of our granite wonderland, the way the light plays with the flora and the fauna and the chance to capture it on camera. And the feeling of being one with it all and yet, so very small.